Finding myself with a bit extra in my checking account and without any credit card bills in sight (woo-hoo! 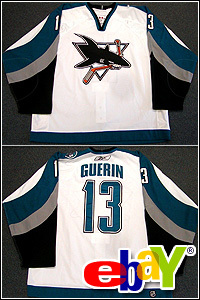 ), I took a big step backwards and went hunting for game worn hockey jerseys. My vice. I had one in my sights. Thankfully it wasn’t a really high priced one, but still one that would fit nicely into my collection. I set-up a last second sniper bid and went to bed confidently thinking it would be mine in the morning. It doesn’t happen very often, I have to admit, but I was outbid. The strange thing is that there wasn’t that feeling of disappointment when I saw the email letting me know that I had been outbid — an obvious sign that I didn’t really want the item in the first place. But throughout the day yesterday, it had me thinking, I was totally prepared to PayPal out a few hundred dollars the night before. I sent it to the mortgage company instead. Or perhaps I’m just turning over a new leaf. Considering a Hybrid to Save Money? Think again!